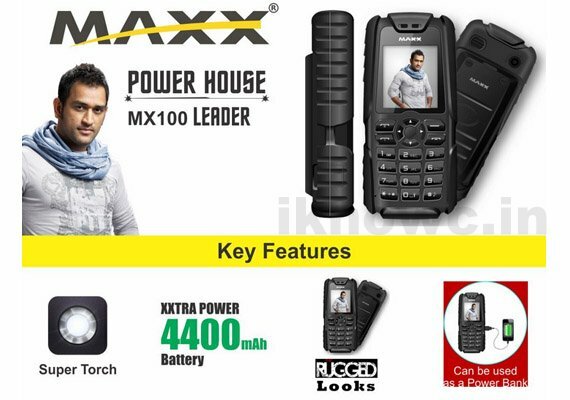 Maxx mobiles has launched a very attractive feature phone, the MX100 Leader. There are some specs that sets the MX 100 leader apart from other feature phones available in the market. The phone was launched at Telecom Exhibition 2013 in New Delhi. The phone comes with a massive 4400 mAh battery. The company claims that the battery can also be used as power bank to charge other phones. The handset has robust built, button are tactile and rugged design. The Maxx MX-100 Leader has built in flash, Digital camera, Bluetooth, FM radio, MP3 / Mp4 Player and Dual SIM support. The Maxx MX100 Leader also features GPRS connectivity, 16GB of expandable storage. The Exterior of the phone is designed in such way that it can protect the phone from dust and water to a certain extent, said the company officials. The Maxx Mx100 is priced at RS. 1,932 and will be available from online retailers and shops across India.